Jussi Parikka's media archaeology focused ideas, notes and short draft writings. For me, last year it was Gebhard Sengmuller’s A Parallel Image, and this year Rosa Menkman’s The Collapse of PAL: the media archaeological highlight of Transmediale. Menkman’s performance dealt with obsolescence, death of media, and what is most interesting, media archaeology of signals and signal formats. Instead of the focus on devices, even if at times lost and outside mainstream, we are seeing new perspectives that take in their focus components, processes and such “minor elements” of media history. 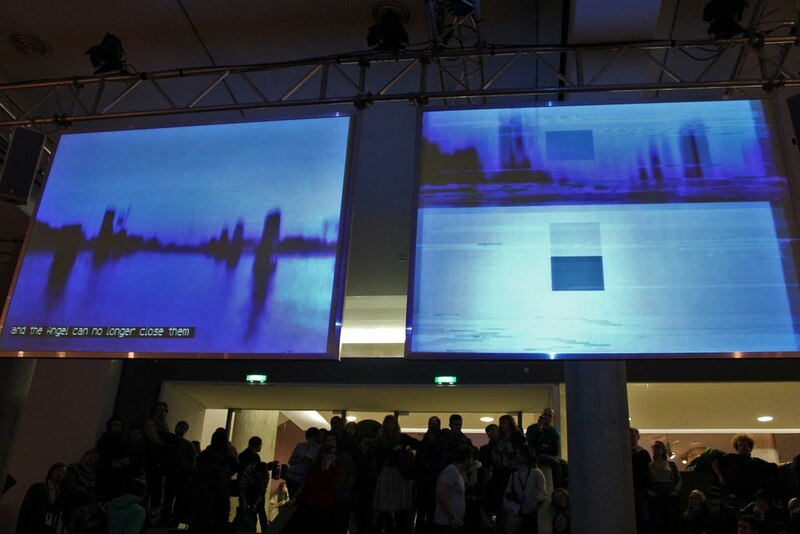 The performance was a two-screen installation with Menkman using various audio and video sources and the signal twisted, modulated, bent. She combined the signal with a Cracklebox, a European telephone signal, Morse code and an old Casio keyboard among other things (info from the Transmediale 2011 programme book). The screens were filled with electronic signal landscapes, of waveforms and at times recognizable Gestalts. The angel from future, a Benjaminian figure of critique of progress, was the protagonist through whose mouth the Collapse of PAL painted a history of the PAL signal as loser to for example the DVB signal. The terms such as losers of history, history excavated in midst of rubbles, storm of progress which works to hide the multiplicity in history all point directly to Benjamin’s famous On the Concept of History text. Despite the fact that I loved the performance, I also sensed the danger of nostalgia in this strong defensive reaction of history of losers – which was framed through an idea of progress as the force that blindly abandons all that it considers inefficient. A critique of rationalism and progress, the other aspects of the media archaeological gesture of the dialectics between losers and emerging media is not grounded enough. To what extent are we in danger of celebrating past media just for the sake of our emotional attachment to them as childhood memories and part of the collective media memories that are now in danger of being lost with new signal solutions and media environments? How to differentiate the media archaeological critique from nostalgia, and hence from a crucial part of the late capitalist consumer media sphere that Fredric Jameson pointed out as one crucial affective feature of contemporary culture?